Headquartered in downtown Milwaukee’s PUBLIC SERVICE BUILDING, We Energies is Wisconsin’s largest electric and natural gas utility. The publicly-traded company serves eastern Wisconsin and Michigan’s Upper Peninsula. A subsidiary of parent company WEC Energy Group, We Energies’ 21st-century portfolio includes coal, natural gas, nuclear, oil, and renewable energies. The firm dates back to THE MILWAUKEE ELECTRIC RAILWAY AND LIGHT COMPANY (TMER&L), which focused, as the name suggests, on transportation and illumination infrastructure. Organized under Henry Villard’s North American Company, TMER&L was America’s first integrated power utility, generating energy for lighting, power, and traction. A series of corporate mergers between 1938 and 1941 joined TMER&L with the Wisconsin Electric Power Company and North American Company’s Wisconsin Gas & Electric and Michigan Power Company holdings. However, anti-monopoly legislation soon forced North American Company to dissolve in 1946, rendering Wisconsin Electric independent. Its facilities included the Lakeside Power Plant, the nation’s first to run on pulverized coal, and another plant in PORT WASHINGTON. Wisconsin Electric’s capacity grew after World War II. 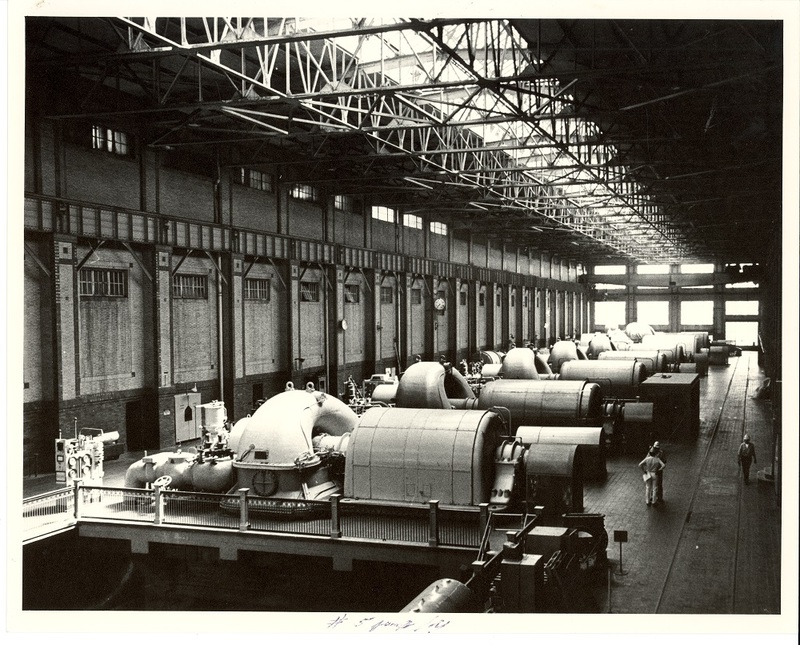 Between 1953 and 1968, the company built eight generators at its Oak Creek Power Plant. Soon after, it began construction on Point Beach Nuclear Plant, ultimately gaining a global reputation for efficiency despite environmentalist concerns about radiological pollution. To reduce capital costs, in 1964 it joined the new Mid-America Interpool Network, a massive power pool that synchronized efforts to share energy region-wide. In 1975, the company announced a strategic plan to shift energy consumption away from peak demand periods, raising subscriber rates seasonally. This decision encouraged legal action from consumer-rights groups. The region’s growing energy demands encouraged Wisconsin Electric to install two new coal-fired units at its Pleasant Prairie Plant during the 1980s. With the addition of real-estate development, investment, and technological equipment holdings, Wisconsin Electric restructured in 1987 as Wisconsin Energy Corporation. In 2015, the company changed structure again, becoming the WEC Energy Group. In 1996, Wisconsin Energy Corporation’s Wisconsin Electric and Wisconsin Natural Gas holdings combined, eventually rebranding themselves as We Energies in 2002. 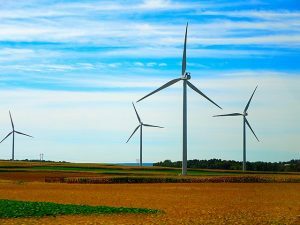 As We Energies, the company began to develop renewable energy sources and reduce emissions, building wind turbines at its Blue Sky Green Field Wind Energy Center and Glacier Hills Wind Park and refitting coal plants to comply with Environmental Protection Agency standards. Its OAK CREEK expansion site and its Port Washington Generating Station continue to burn fossil fuels. ^ Thomas Content, “Power Drains Our Wallets,” The Milwaukee Journal, April 9, 2006. ^ WeEnergies, “Key Facts,” accessed on October 4, 2012. ^ John Gurda, The Making of Milwaukee, 3rd ed. (Milwaukee: Milwaukee County Historical Society, 2008), 195. ^ John Gurda, Path of a Pioneer, 33. ^ WeEnergies, “History,” accessed on January 19, 2013, http://www.wisconsinenergy.com/aboutus/history.htm, now available at WEC Energy Group, “History,” accessed December 16, 2016. ^ “Utility System Prepares Plan to Comply With ‘Death Sentence,’” The New York Times, July 21, 1943, 21. 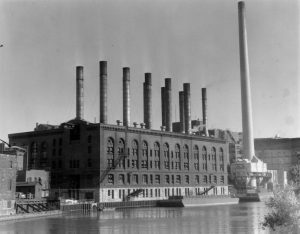 ^ “Lakeside Power Plant,” The Milwaukee Sentinel, January 1, 1921; “Power Projects Make Utopia of Port Washington,” The Milwaukee Sentinel, November 24, 1935. ^ “Utility Plans Bigger Plant in Oak Creek,” The Milwaukee Journal, January 18, 1965. ^ “Fine Agreement between Utility, Environmentalists,” The Milwaukee Journal, September 11, 1970. ^ Gene Smith, “Giant Power Pool Set for 10 States,” The New York Times, November 25, 1964, 51. ^ Judy Wenzel, “Power to Spare,” The Milwaukee Journal, February 5, 1984. ^ “Time of Use Power Rates Challenged,” The Milwaukee Journal, August 3, 1978. ^ Wisconsin Energy Corporation, “History,” accessed on October 7, 2012, http://www.wisconsinenergy.com/aboutus/history.htm, now available at WEC Energy Group, “History,” accessed December 16, 2016. ^ WEC Energy Group, “History,” accessed December 16, 2016. ^ Thomas Content, “Huge Wind Farm Proposed: WeEnergies Wants to Build up to 90 Turbines in Columbia County,” Milwaukee Journal-Sentinel, October 28, 2008. ^ Associated Press, “We Energies to Upgrade 5 Coal Plants,” The Daily-Telegraph, April 30, 2003, C3. Gurda, John. Path of a Pioneer: A Centennial History of the Wisconsin Electric Power Company. Wisconsin: Wisconsin Energy Corp., 1996. Gurda, John. The Making of Milwaukee. 3rd ed. Milwaukee: Milwaukee County Historical Society, 2008. McDonald, Forrest. Let There Be Light: The Electric Utility Industry in Wisconsin, 1881-1955. Madison: American History Research Center, 1957. Moore, Karen W. “Missed Connections: The ‘Progressive’ Derailment of Public Transit in Metropolitan Milwaukee during the Electric Street Railway Era.” PhD diss., University of Wisconsin-Milwaukee, 2011.